A Day Late and A Dollar Short: Caribou Coffee - $2 Latte! 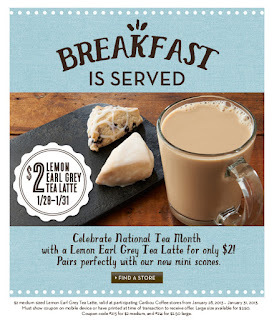 Caribou Coffee - $2 Latte! Tomorrow through 1/31, you can try Caribou Coffee's Lemon Earl Grey Tea Latte for only $2. Pairs perfectly with their new mini-scones. Visit the Caribou Coffee website to find a location near you.